My fall-foliage photos always seem out of season compared with the rest of the world, Kyoto not getting its color until mid November after much of the Northern Hemisphere's autumn has passed. 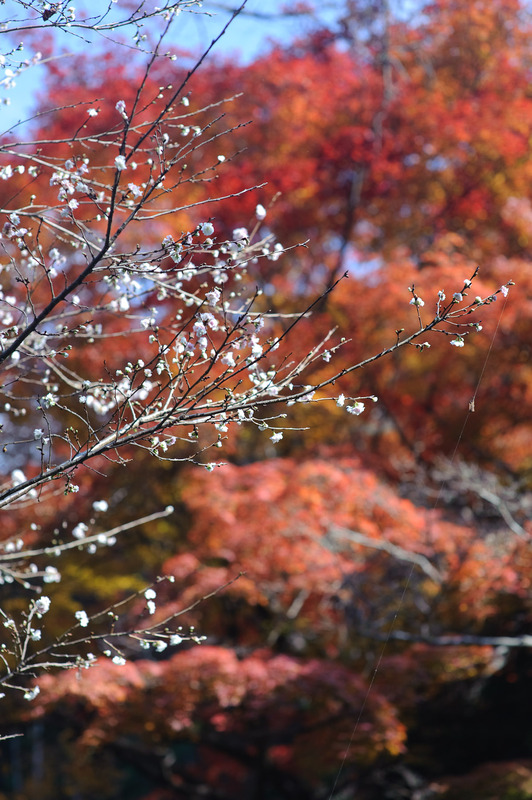 In line with that, this post features an out-of-season element in an out-of-season photo: cherry blossoms in late November. Five minutes away from my place, buried back in the mountains of eastern Kyoto, is the small Himukai Shrine, featured in “Thatched Roofs and Colored Canopies” and “Changing Seasons, Changing Lenses” earlier this month. Among the spectacular colors I didn't even notice the lone blooming cherry tree off to one side until it was pointed out to me. At the far right, you can see part of the Gate of Disrepair. I knew that cherry can bloom in January.... in Okinawa, where Spring arrives after Summer hasn't really left. I never knew that there is a variety of cherry blossom that blooms in the fall/winter, but there you have it. Despite the Japanese name 十月桜 (jyuugatuzakura, “October Sakura”), they apparently bloom through January, and again for a short time in the Spring (when the rest of the cherry blossoms boom). I'd never heard of such a thing. 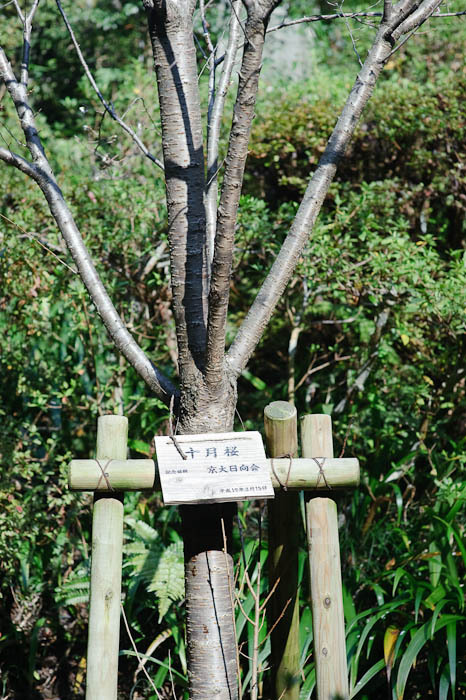 According to this page, the scientific name is Prunus subhirtella cv. Autumnalis. ‘Autumnalis’ is a very popular cultivar in the British Isles and Europe and, no doubt, in suitable parts of North America, too. In Britain, it tends to produce intermittent flushes of blossom in mild weather in late autumn and winter, with the main blooming in early spring. There is also ‘Autumnalis Rosea’ with slightly deeper pink flowers. For whatever reason, we fail miserably with ‘Autumnalis’ in our Welsh garden – they just die on us. I am very envious of your late autumn – you may have heard of the snowy and icy weather in Europe; I know the northern US has had some real winter already, too. Oh, so glad to hear from you again, Peter. One question: are these simply flowering cherries, or will they bear fruit? Hello, Grandma Friedl, and a Happy New Year to all the family. I don’t recall ever seeing fruit on the autumn-flowering cherry, perhaps not surprising as the flowers are semi-double, so the important bits may not be functional. Prunus x subhirtella, to which it belongs, is now thought to be a hybrid, so may be sterile for that reason. If it were to fruit, I suspect they’d be small and very bitter. 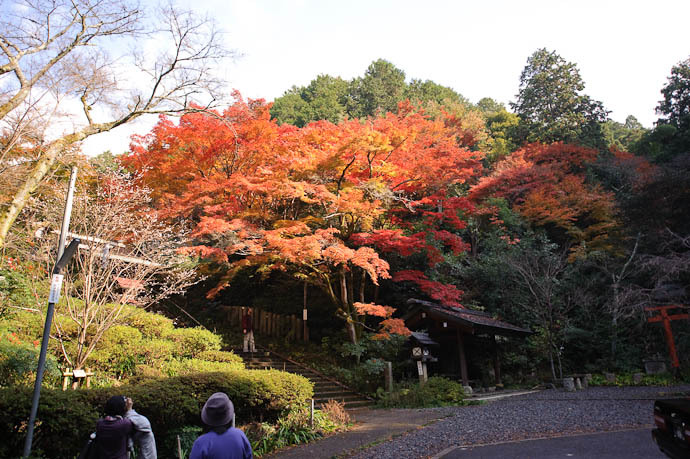 I’m asked often on late August to Sept about the fall colors here in New England and to compare them to Japan.. I spent 4 years in Okinawa and I never once saw the colors you managed to capture..